Below you will find our more general gift questions. For specific questions regarding our gift baskets, candy bouquets and diaper cakes, please use the FAQ sub menu on the left. Most gift orders are received through our website, but you may also order via phone, email or fax. Visit our "Contact Us" page for these phone numbers and email address. Can I order now, but have delivery later? 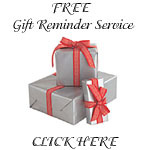 Absolutely, and this is becoming more popular, as more clients are using our Free Gift Reminder Service. If you are ordering via the website, just enter the delivery or shipping date in the "Special Requests" box. If you are ordering by phone or email, you can inform us of your delivery or shipping date then. When will my gift be delivered or shipped? Most gift orders (gift baskets, gift boxes, gift bags, candy bouquets, candy cakes and diaper cakes) that are delivered locally within Montreal or shipped throughout Canada, will be delivered or shipped the next business day after receiving your order, unless a future date is requested. Exceptions to this time frame are holidays, when we are extremely busy... but even then, most gifts will be sent out within 2 business days. How are your gifts delivered and/or shipped? For local deliveries, we have 2 drivers and also use local couriers as well if needed. For our shipping needs, we use FedEx Ground. Can I replace/exchange some products for others in the gift? Yes, of course. We encourage you to help us create a gift that is a close to perfection as possible for you and your recipient. As long as we have the procucts in stock, we can exchange coffees for teas, chocolates for cookies for example. We do this quite often with our gift baskets and candy bouquets.